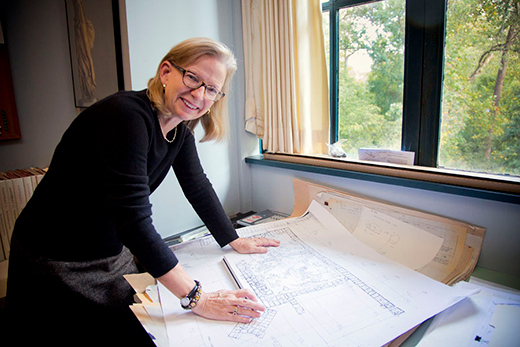 Bonna Wescoat, Samuel Candler Dobbs Professor of Art History, will lead a $246,000 Getty Foundation grant, “Beyond the Northern Aegean,” to facilitate scholar-student research travel studying how ancient Greek architectural ideas were adopted and adapted in the wider Mediterranean world. Emory art history professor Bonna Wescoat is spearheading a two-year international traveling seminar program to explore ancient Greek architecture, funded by a $246,000 Getty Foundation grant. “A chief goal of the Getty Foundation’s ‘Connecting Art Histories’ program is to bring scholars and students together to catalyze potential partnerships and collaborations, particularly in areas of the world where there have been challenges in facilitating communication for one reason or another, such as politics or economics or different cultural frameworks for education,” says Wescoat, Samuel Candler Dobbs Professor of Art History. The group’s focus, she says, is how building design, techniques and materials — and the ideas they conveyed — were communicated from the Aegean Greek world into areas such as Thrace, a fabulously wealthy ancient kingdom in the highlands of Bulgaria, or the many communities that dotted the Black Sea coast. The new grant builds on Wescoat’s expertise in researching and teaching about the art and architecture of ancient Greece. Since 1977, she has traveled to the Greek island of Samothrace for excavations meant to uncover the history and legacy of the Sanctuary of the Great Gods. She was named to the directorship of excavations in 2012, overseeing work at one of the most significant ancient sanctuaries in Greece. The new travel seminars will include visits to Samothrace. Wescoat emphasizes that the grant application and administration is “definitely a group effort” involving scholars across North America, Europe and the Mediterranean. “Emory has been terrific in being the home for it and providing the institutional support to lead the program successfully,” she says. The program’s seminars will expand the previously limited opportunities to collaborate with scholars working in Bulgaria, Romania, Ukraine, Poland and Russia. “The time is right to bring our emerging career scholars there and to bring their young professionals into Greece and Turkey, to mix it up so that the next generation has the opportunity to see ways to go forward together,” she notes. The program aims to serve 20 people. The senior team, which put together the grant proposal, includes American, Italian, French, Bulgarian, Romanian and Ukrainian scholars. The student team will have North American, European, Greek, Turkish, Romanian, Bulgarian, Ukrainian, Polish and Russian emerging career professionals. The process to select the participants will begin this fall. By June 2019, the group will be traveling from Greece and up into Bulgaria; the second traveling seminar, which will take place in 2020, focuses on Turkey and the northwestern coast of the Black Sea. Participants will be asked to commit for both years. The opportunity for international students and scholars to collaborate in studying ancient architecture can have impacts long after the seminars end, Wescoat says. “The fruition will not just be within the next year or two necessarily. It could come in five or 10 or even 20 years out from now,” she says, explaining that building relationships between the younger scholars could lead to future collaborations and programs that they may not even envision now. “I’m excited about this project for Emory, because we have a fantastic art history program and we’re very much reaching out across all parts of the world. This is our first major foray into the area of Thrace and the Black Sea,” she says. “This material will start becoming part of my classes in a way that it isn’t currently, and I’m also hoping to branch out to other parts of the university where things are happening in these regions to see if they are interested in being involved,” she continues.